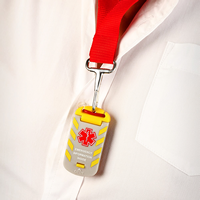 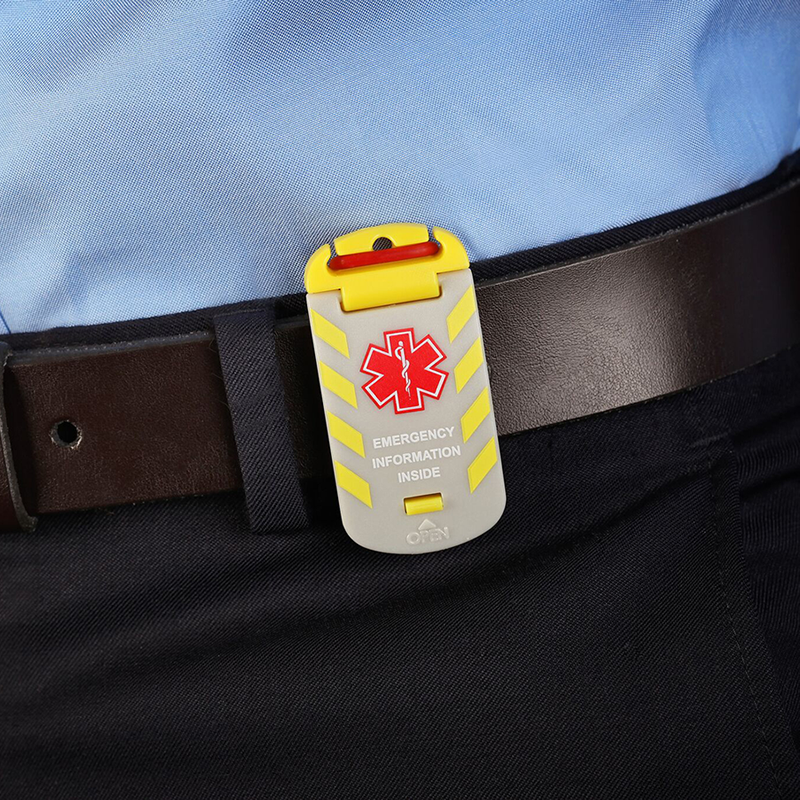 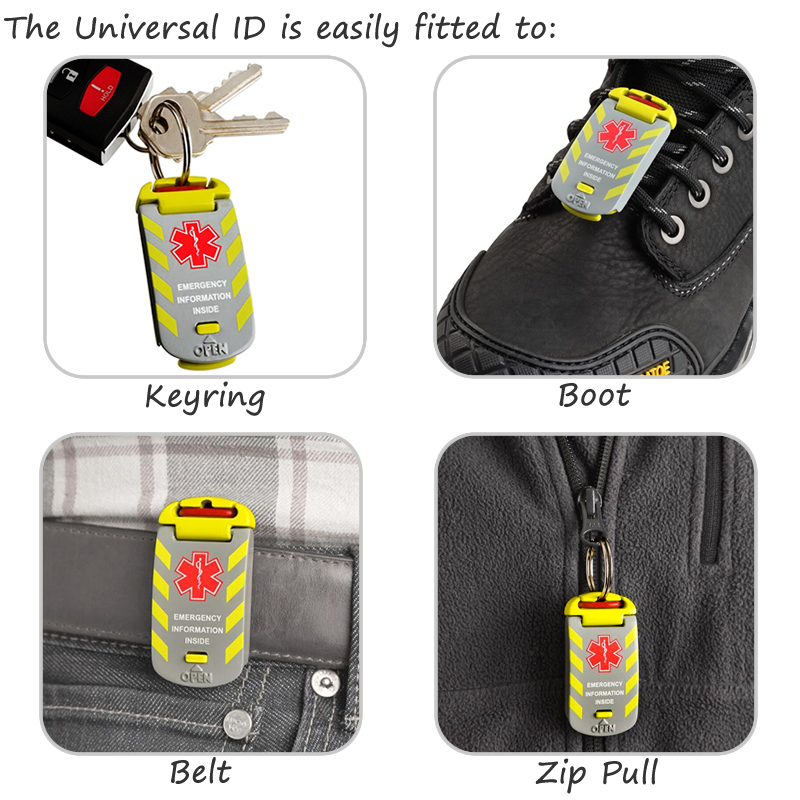 Constructed from the same polycarbonate material used to manufacture safety helmets, the Universal Fit Emergency ID has a versatile, shockproof case with adjustable cord that can be fitted to clothing and safety gear—making it suited for a variety of different industrial applications. • Durable, watertight case withstands temperature extremes—hot or cold, and is weatherproof. 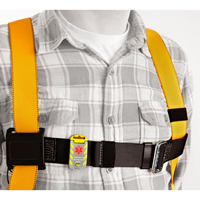 • Elastic "shock-cord" fitting system allows the case to be attached to boots/shoes, clothing, harnesses, fall restraints, belts, backpacks, etc. • Supplied with a key ring hook for attachment to keychains and lanyards. 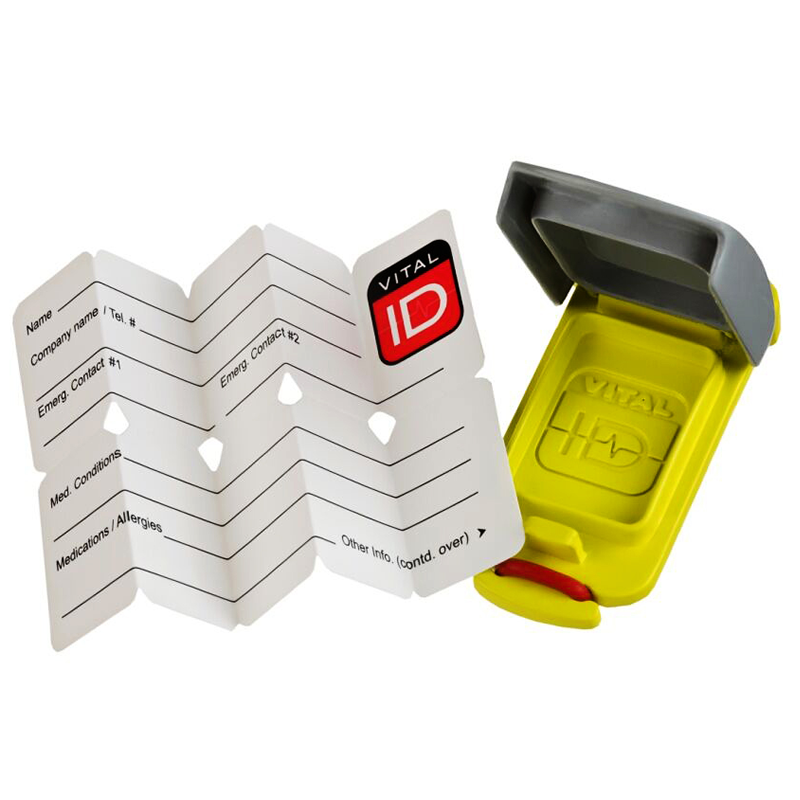 • Fully waterproof ID card stores 500 characters (four times the information of the HH-WSID-01 and two times the information of the HH-WSID-02). 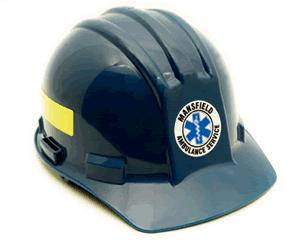 • Ideal for applications in industries where hard hats are not routinely worn, or required. • Constructed from sturdy polycarbonate plastic, the shockproof case with high-strength shielded hinge ensures years of dependable service in extreme temperatures—hot or cold. 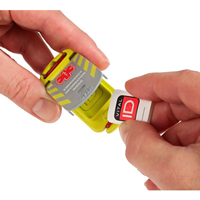 • The watertight gasket sealed lid with plastic spring latch is designed to be weatherproof—to keep your information safe and secure against the elements. 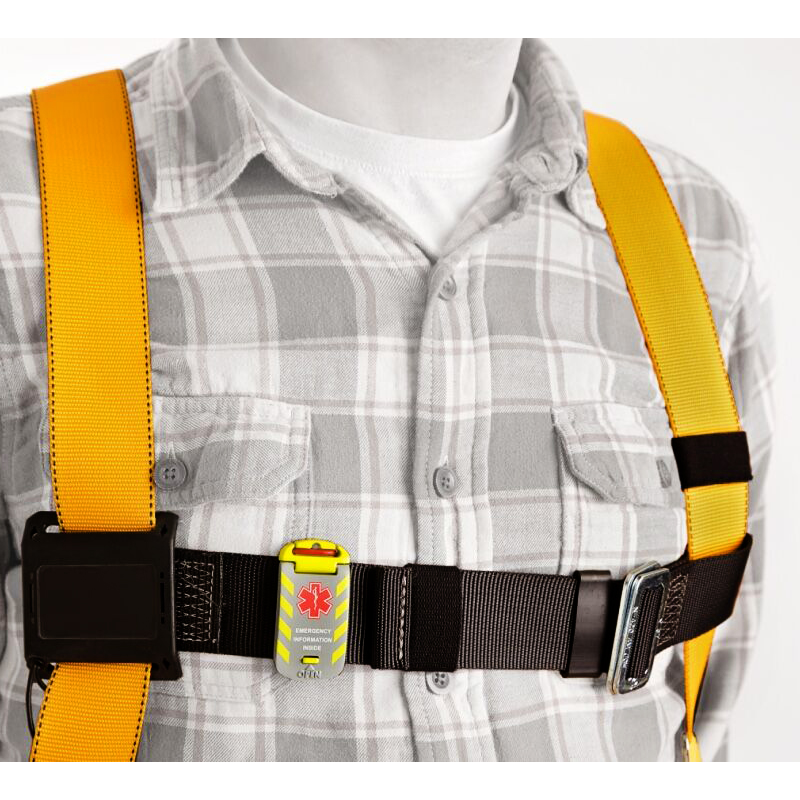 • The elastic "shock-cord" fitting system allows the ID to be fitted to boots/shoes, clothing, harnesses, fall restraints, belts, backpacks, zipper pull tabs, and other work gear. • Durable ID cards are made of 100% waterproof synthetic paper and fully retains all information when used with a permanent marker or pen. 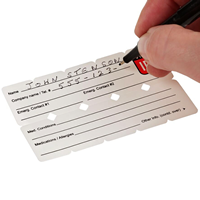 ID cards holds a maximum of 500 characters (depending on type size) which is twice the capacity of the WSID-02. • Supplied with a brass keyring with a spring-loaded hook for attachment to landyards or keys. 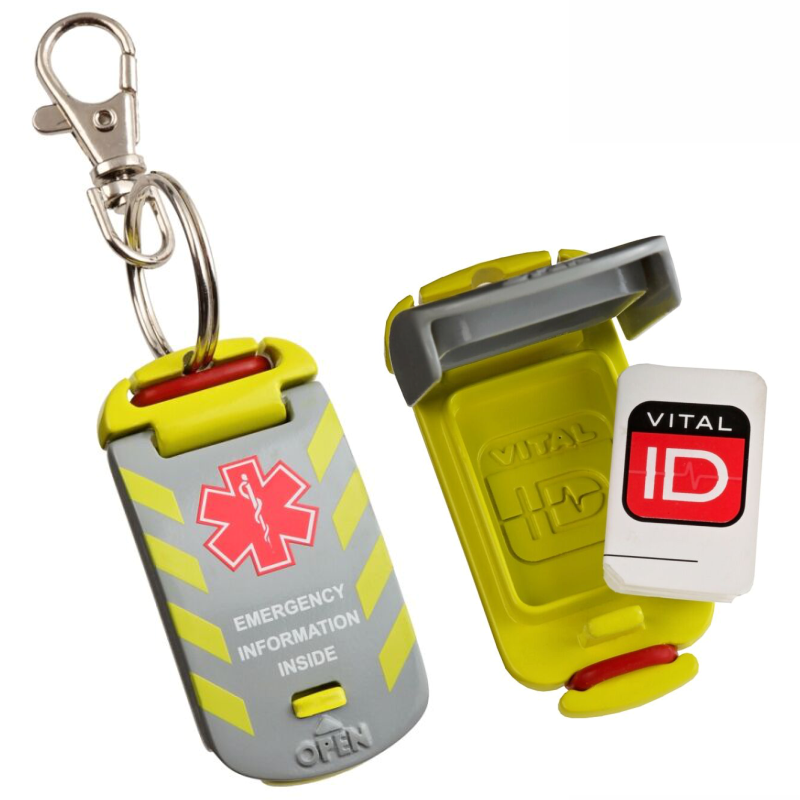 • Flexible and versatile in how it's used, the durable case can be easily moved between uses by utilizing the shock-cord system, plus it features the largest storage capacity of any of our medical IDs.